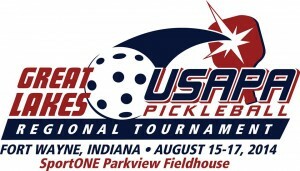 The USAPA currently holds five official pickleball tournaments each year: The National tournament in Buckeye, Arizona, along with four regional tournaments, the Atlantic South Regional, the Mid South Regional, the Southwest Regional, and the just completed Great Lakes Regional in Fort Wayne, Indiana. 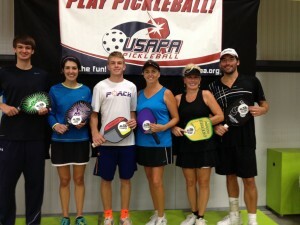 SportONE / Parkview Fieldhouse was the scene for 3 days of fun, exciting pickleball. Things kicked off Thursday night with an open practice session for all the players. After practice, players took off for some of Fort Wayne’s famous bevy of great restaurants, like Granite City Brewery, Mad Anthony’s Brewery, as well as B Antonios and the fabulous Fort Wayne Casa restaurants. After the traditional rules and guidelines talk, Friday morning kicked off with the National Anthem and then began a day of singles matches that ran from 8:30 am until 3:30 in the afternoon. All 12 courts were busy and buzzing in a day which included one of the best men’s 5.0 brackets ever assembled east of the Mississippi. 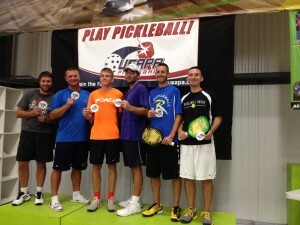 After the dust had settled, Will Wilson, age 21, of Commerce Township, Michigan came away with the coveted Gold, followed by 19 year old Kyle Yates of Fort Myers, Florida and Rob Elliott from The Villages, Florida. Saturday morning, our biggest day by far, we knew we had a huge task ahead with a building full of men’s and women’s doubles teams waiting to start. As we readied the courts for play, Roger Workman, our tournament operations manager, looked at us and said, if everything goes the way it should, we will be done by 7:00pm tonight. So with a small amount of disbelief in our heads that we could possibly get it all done on time, we played the National Anthem and headed everyone towards their assigned courts. 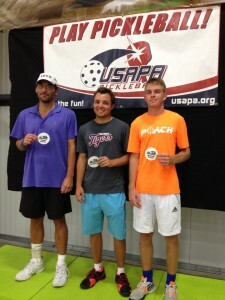 Many hours later, the final match wrapped up and we herded everyone to the USAPA medal podium for one last awards presentation. As we walked towards the podium, we looked at the clock and it said 7:07pm. 7 minutes late. Not bad Roger! 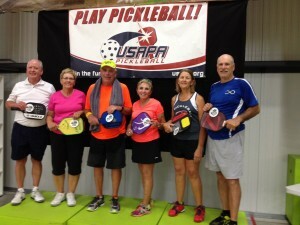 Sunday had another huge crowd of mixed doubles teams, but once again the many tournament volunteers came through with flying colors and another almost perfectly timed day. Roger said we’d be done at 5:00. Roger would have been dead on except for the very last match, a 3.5 (65+) mixed battle (won by Bill and Eileen Regan) that ended up 11-9, 11-7, 7-11 and 15-13. So after 287 matches played over three days, we ended at 5:30 Sunday. A great tournament put on by a great city with a ton of tremendously dedicated volunteers. A quick shoutout to co-tournament directors, Ken Flora and Julie Hollingsworth, plus referee coordinator Winnie Montgomery. 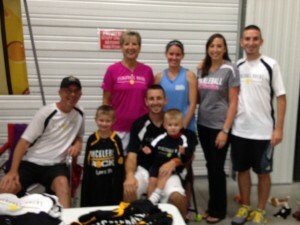 A lot of people were giving undue credit to the Grubbs family for putting this tournament together, All and we mean all the credit is deserved by these great people and their teams.